Here's a look at the official press release for OPI's Nicki Minaj Collection coming out in January 2012. If you'd like to view some nail wheel swatches of this collection, along with their upcoming Spring 2012 Holland Collection, Beautygeeks has a preview here. Pink Friday Kick off the weekend with this pop! of bubblegum pink. Metallic 4 Life This charcoal sparkle flies with the stars in the skies. Save Me I drove for miles just to find this silver-rainbow glitter. Fly I came to win, to fight…and to wear this aqua. Did It On ‘Em A lusty little lacquer that loves the “lime”-light. I am looking forward to the glitter and the blue one! I'm also looking forward to the blue glitter. 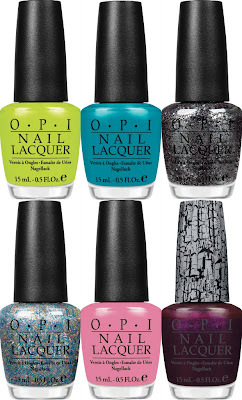 I'm not really digging the Nicki Minaj collection, but the Holland collection looks awesome! Especially "I Don't Give a Rotterdamn!" and "I Have a Herring Problem." I think I like that collection because I'm of Dutch descent. Thanks for the link to the swatches - I never can tell a thing from the icky graphics OPI puts out - I think they do it on purpose so no one can really tell what's coming and rush to dup it. I want the top two, and the bottom two!